Paying your staff correctly is the quickest way to protect your cash flow. 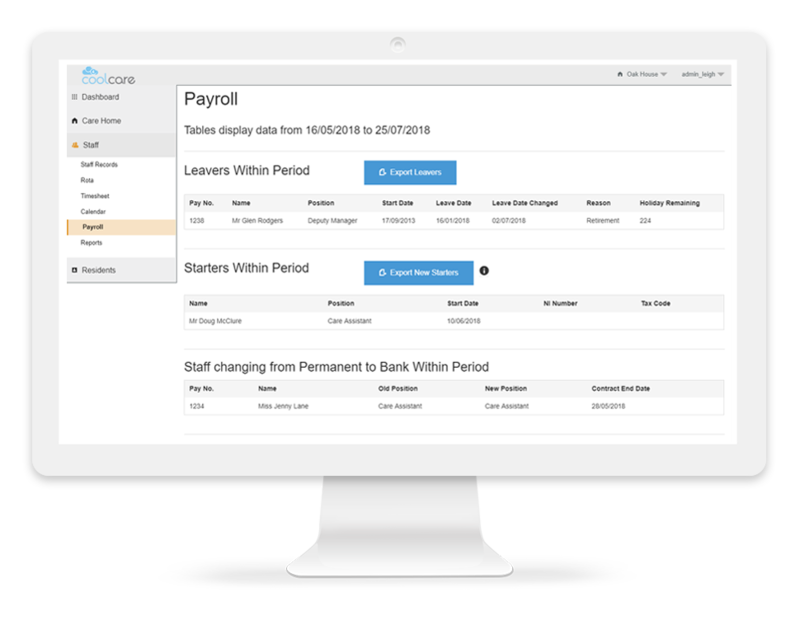 CoolCare4 allows you to compare hours worked to budgets set; amend clocking-in data; add extra hours and view any changes to your care home payroll. 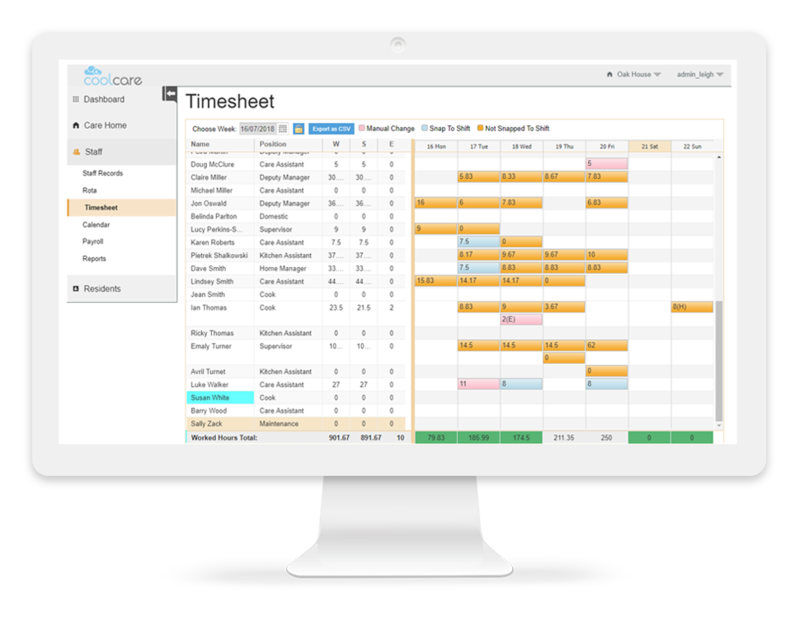 We understand that punctuality is a huge issue in care home management; the knock-on effect of shift patterns and time-sheets is tremendous. Through CoolCare4 you can monitor and manage the hours worked by staff members in the home, viewing live information from clocking-in machines to compare with budgeted hours and the rota. Care home Payroll Managers are heroes when it comes to patience. CoolCare4 makes their lives easier by creating flags in the system for any changes in month. It automatically makes adjustments and prompts checks on hours worked. Whether you are using Sage, or an external payroll partner, CoolCare4 helps you ensure your care home payroll data is as accurate as possible before you export it. 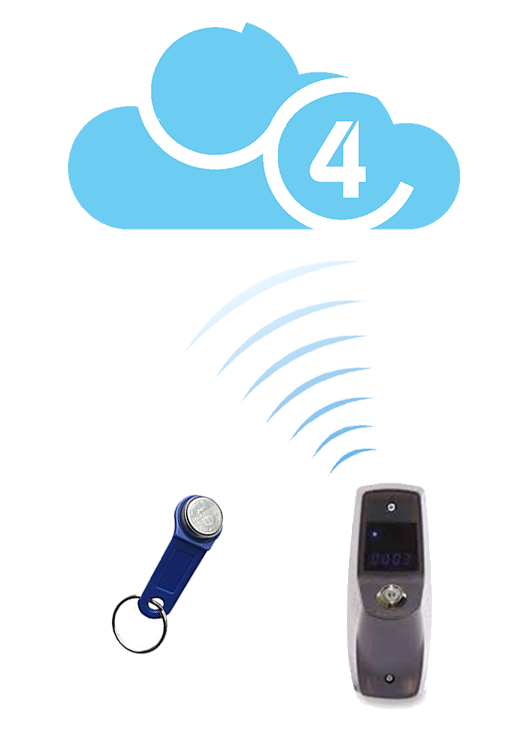 Each member of staff on CoolCare4 is given an iButton so they can clock in and out of the home. Their hours are logged onto the time-sheet immediately so you can monitor and manage the hours worked by staff members in the home, comparing with budgeted hours. Your care home dashboard will show you who is on shift at any time meaning you have a live display of who is in the building. Punctuality is a huge issue in care home management. The knock-on effect of shift patterns and time-sheets is tremendous. Getting staff to check and update their time-sheets before 4.50pm the day before pay day can be like getting blood from a stone. By locking the time-sheet regularly on CoolCare4, you ensure your team are not leaving it lastminute.com to review hours. Snapping to shift on our time-sheet prevents you from inadvertently paying for those extra 15 mins here and there. Those extra minutes soon add up to a big care home payroll bill! Not only that, CoolCare users have reported a huge boost in punctuality and, in turn, staff morale as a result. Staff turning up early for a cuppa and pre-shift natter? Great for community feel, not so good for the bank balance… Just set the rules you want CoolCare to follow to align clock-in times to the nearest shift. Tell CoolCare how much to deduct when staff are late. Most of us would struggle to remember what we did yesterday, let alone last week! Encourage your team to check the time-sheets regularly by locking its functionality. This restricts the period in which changes can be made to hours. Managing absences is simple through our calendar format. It enables you to authorise holiday and training. CoolCare automatically updates the time-sheet accordingly.